The Flood of November 2016 – a New Cycle? Visualize the problem. The perspective map of the Meadowdale Industrial Development below (click to enlarge) shows the catchment basin and the extent it is roofed over. Run-off from roofing is 100%. Storm run-off funnels to the low point at the R24 Freeway where it enters a culvert and emerges in the suburb of Buurendal. This view shows only the lower section of Meadowdale, the upper section Tunney adds to the run-off. Then visualize the magnitude of the destruction on 9 November 2016. Water poured across the R24 Freeway 60 cm deep, flattening 40 – 50 m of fencing. It overwhelmed the retention dam and flowed diagonally across the suburbs. The flood followed the natural slope of the ground and original path of the stream. About 80 homes inside this path suffered damage. As the Meadowdale development grew in the 1990’s there appears to have been no concern that the downstream suburbs in Edenvale were at risk. Then homes in Buurendal were flooded on 12 November 1997, something that had not happened before. On 19 November 1998 a devastating flood followed, affecting not only in Buurendal but homes and industries downstream in Eastleigh and Edenvale. 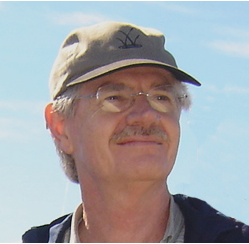 Residents of Buurendal asked the local authority, Greater Germiston Council at the time, to address the problem. They appointed consulting engineers who developed several options. The option recommended had three phases: First build a retention dam of capacity 2 800 cu m on a park land between Minuach and Donald Roads to manage a 1:10 year flood event. This was completed in 2000 and it is the Buurendal Retention Dam we know today. Phase 2 expropriate six properties and increase the capacity of the dam to 11 500 cu m to manage a 1:25 year flood. Phase 3 expropriate a further three properties downstream, building an open channel to a second retention dam in an existing open area. This dam would have a capacity of 20 000 cub m to manage a 1:50 year flood. Phases 2 and 3 were not done. On 12 January 2002 the suburbs downstream of the Buurendal Dam were flooded once more. Reacting to this the Director: Technical Services Ekurhuleni told residents that Phases 2 and 3 would proceed. 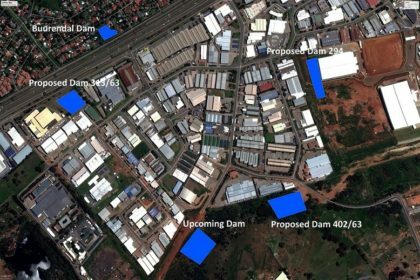 The funds to acquire the additional properties were provided in the 2002/2003 budget, and funds for the second retention dam would be in the 2003/2004 budget. In 2004 two properties east of the dam were purchased and the dam enlarged to 6 500 cub m.
But Phase 3 and the greater part of Phase 2 were not done. A drier period followed 2002 and flood matters became less urgent. It was also thought that storm water plans for the development of new Meadowdale extensions might make any further work at Buurendal unnecessary. Development continued and about half the roof surface in this lower central section of Meadowdale in 2016 was built after 2002. On 3 February 2009 a major flood caused damage in Buurendal and suburbs and industries downstream in Eastleigh and Edenvale. Again residents of Buurendal banded together and this time submitted a petition to the Gauteng Provincial Legislature. 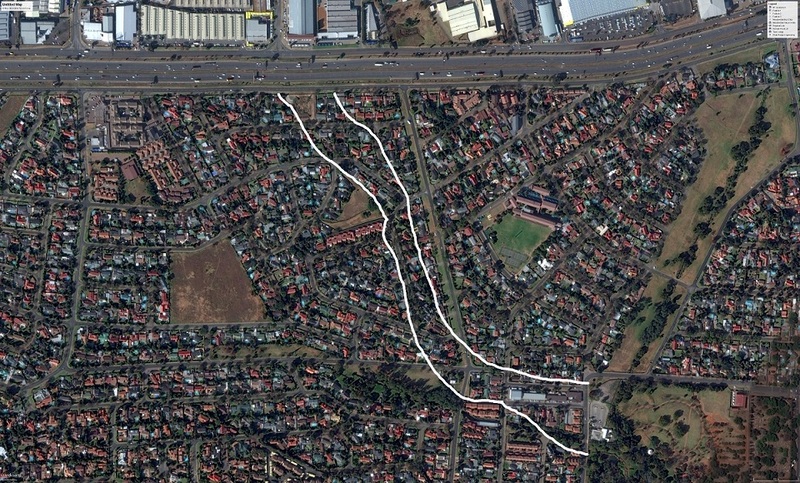 Ekurhuleni responded and appointed consulting engineers Aurecon to investigate and produce the Stormwater Plan of 2011. In the meantime development in Meadow continued and some measures were already being considered or being implemented. Buurendal Dam was cleaned and upgraded. This took more than two years and was completed in August 2011. At a public meeting on 25 February 2010 Ekurhuleni presented solutions and told residents the dam at the top of Albert Amon Road was already in the budget. This retention dam was mentioned in meetings and newspaper reports through 2010 and 2011. In the 2011 Stormwater Plan it is called it “Upcoming Dam”, as if already in process. Storm water run-off from the eastern development in Tunney was directed to the Harmelia Stream, through a berm built in Klopper Park. This option was not fully developed since Phase 2, the upgrade of an existing retention pond above Bell St, was not done. In 2016 there is a car park over the site of the dam shown in the original consulting engineer report. In addition the flood of 9 November crossed the diversion to Harmelia Stream and followed the natural flow to Buurendal. The Storm Water Plan of 2011 consolidated options to control run-off in Buurendal and problem areas of Meadowdale. In the central Meadowdale catchment the consultants proposed four retention dams to reduce the flow under the R24 into Buurendal Dam from 56 cub m/sec to 23 cub m/sec in a 1:20 year event. The proposed retention dams are listed below and shown on the map of Meadowdale in 2011. In the Stormwater Plan of 2011 run-off from the Greenhills and Tunney west developments was to be directed to the existing lake for attenuation in the 2011 storm water plan. On 26 October 2016 homes immediately below the Buurendal Dam were flooded when the dam overflowed. Two weeks later we have the devastating flood of 9 November that caused damage in Buurendal, Hurlyvale, Eastleigh and Edenvale. At this stage, little of the 2011 Storm Water Plan seems to have been implemented. As at November 2016 (following map) no retention dams have been built. 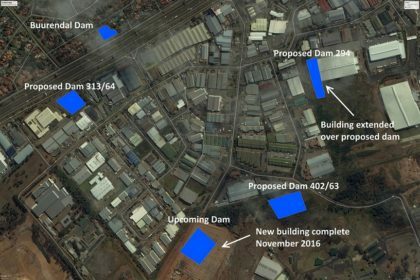 Two of the proposed dam sites have been built over, including the “Upcoming” dam site. The diversion of run-off from Tunney to Harmelia Stream is ineffective. Will history repeat itself, or can Cycle 3 be avoided? Officials from both Johannesburg and Ekurhuleni described the floods in Edenvale and Bedfordview on 9 November 2016 as a 1:100 year event. It may the most severe flood in 100 years, but the rainfall that brought it on is not that unusual. What has changed are conditions on the ground that make flooding possible, and the next event cannot be far in the future. To give it context, rainfall modelling for this region, presented in the Storm Water Plan of 2011, is 138 mm for a 50 year event and 168 mm for a 100 year event. The highest 24 hour rainfall recorded at O R Tambo International Airport over 70 years is 187 mm. On 9 November 2016 two sites in Edenglen measured 110 and 112 mm rainfall respectively, a site in Isandovale measured 95 mm and O R Tambo International Airport recorded 90 mm. Edenvale has twice received this amount of rain in the last 35 years (the other being 107 mm on 8 February 2000). The table below lists floods at Buurendal where the cause was run-off from Meadowdale, and the rainfall that brought this about. On two occasions in the past Ekurhuleni has rejected claims of damages by residents saying the floods are a force majeure or “act of God”. This means the floods were something that could not be evaded through the exercise of due care. But here we have eight floods in the suburb of Buurendal over 18 years, three of which were major floods causing damage through the entire length of the river in Edenvale. The floods come from a very clear source, and lack of due care from the local authority is evident throughout this period and earlier. The local stormwater control measures planned for Meadowdale should be implemented but are not adequate. I see only one answer that will permanently fix the situation, both for Buurendal and those further downstream. 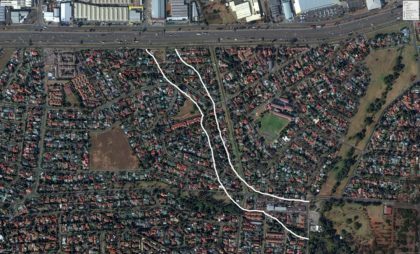 Demolish a strip of houses through the suburbs that lie on the original course of the stream from the R24 to Horwood’s Farm, open up the buried stream and bring it to the surface, and landscape a series of dams and wetlands to slow the flow. Further information on the Edenvale/Eastleigh Stream catchment in given at Edenvale Stream, and at Rainfall and Jukskei River and Catchment Information.